A rare form of red Quartz, Strawberry Quartz is one of the most potent Heart chakra crystals. It helps to balance the connection between the physical heart, heart chakra and higher heart; filling us with a feeling of true love. It also balances the whole physical and subtle body systems. 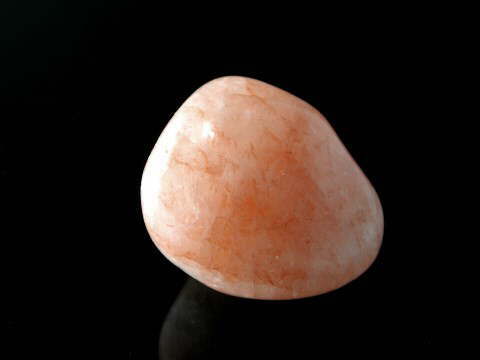 Strawberry Quartz can also assist with connection to the Source or centre of Universal energy where we can find answers to many of the questions surrounding our existence both as an individual and as a race of incarnate humans. More specifically, when used in meditation, it can help us identify why we have chosen this current incarnation, and the lessons needed to progress and to counter Karmic debt. If you decide to use a piece for this purpose, cleanse your crystal and then take some time to become attuned with its energies. Formulate a concise question, remembering to be as clear as possible because this will affect the answers you receive, then try sitting with your crystal held over your third eye for a while as you send out this question to the Universe. When you feel happy that your question has been sent, place the crystal over your heart and clear your mind. Keep your mind open and be aware of whatever images you ‘see’ in your third eye, feelings or emotions you may experience, or words you may hear. It is recommended that during this attunement process and subsequent astral connection work, you do not let anyone else handle your crystal as this will affect both its energy and the answers you receive. This is a crystal which will remain visibly hidden and overlooked until the time we are ready to experience its energies and are also truly willing to receive the information it can impart. Many Strawberry Quartz specimens available are merely dyed glass, especially those found in jewellery, even Rhodonite has been sold as Strawberry Quartz, so as always buy with caution and purchase from sellers you trust. Strawberry Quartz should look and feel like Quartz but with a red/orange sparkle and hue. This specimen is slightly lighter than in the photo.